Founded on the idea that premium cabinetry doesn't have to come at a premium price, Wolf Home Products has formulated a line of rugged, beautiful cabinets that give homeowners more for less. Although the industry mostly reserves jaw-dropping outdoor spaces for high-paying customers, we have taken all the characteristics of high-end cabinets and forged our own path with value in mind. If you're thinking of remodeling your outdoor space and want to add storage, this article will help you learn more about our outdoor cabinetry products. The name is a bit of a giveaway, but Wolf Endurance cabinets are designed to last. Made from powder-coated aluminum that is rugged yet sleek and refined, these cabinets are at home in the harshest conditions. Whether you need cabinets for your garage or an outdoor kitchen for your deck, Wolf Endurance is up to the task. Cabinets that are outdoors, in a garage, or even a mudroom often must deal with a lot of severe conditions that standard cabinets cannot handle, including moisture, salt, extreme temperatures, pollen, dust, rain, ice, and much more. All cabinetry, especially outdoor cabinets, must be easy to clean and able to maintain color and strength - even under the harshest conditions. Wolf Endurance cabinets combine all these features with stunning beauty and elegance. They stay sealed and waterproof, keeping moisture and insects from getting into the cabinets - which keeps your supplies dry and looking like new. Aluminum is among the best building materials regarding strength, resistance to corrosion, and aesthetic quality. 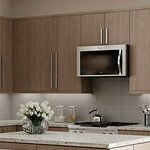 It's also lightweight, making installing and moving the cabinets much easier than those made with other metals. Aluminum is loved for its durability-to-weight ratio — its low weight, easy workability, and structural rigidity make it the metal of choice for high-quality products. Powder coating provides a much stronger finish, which stands up against harsh weather conditions. Wolf's exclusive powder-coated all-weather finish meets AAMA 2604 specifications. Many cabinets are treated with liquid paint, which has several drawbacks. For one, it is less durable and can easily be scuffed and damaged. Secondly, it requires maintenance over time. · Sturdy Face Frame: The frame around the door or drawers are extremely rugged to avoid bending and damage. The face frames on Wolf Endurance cabinets are structurally sturdy and feature high-quality, weather-resistant powder coating. · Solid-Core Doors: Our inset doors have a high-end appearance and feature a solid core for durability and high quality. · Soft-Close Drawers: Wolf Endurance 24-inch deep drawers come standard with full-extension glides with a 100-lb. load rating, ensuring a gentle, quiet close. Say good-bye to slamming drawers and clanking dishes. · Hidden Hinges: We guarantee premium cabinetry for non-premium prices, and perhaps nothing exemplifies our dedication to the small details like our concealed, six-way adjustable hinges. These do their work quietly, reliably, and out of sight. · Adjustable Shelves: Made from high-grade aluminum, Wolf Endurance shelves are full-depth, 3/4" high, and have a 60-lb. load rating. · Deep Storage: Wolf Endurance cabinet boxes are 28" deep, which is considered by many to be the optimal depth for a cabinet. · Sturdy Aluminum Floor: The floor of a cabinet needs to be sturdy. Whether you're storing a full propane tank or a toolbox, Wolf Endurance cabinet bottoms are a one-piece fabricated bottom and sag under weight. · Rubber Seals: Nothing can replace a high-grade automotive rubber seal for keeping moisture and pests out. Our rubber seals form a waterproof barrier to keep your items dry and safe. · Adjustable Legs: Rare is the person who isn't troubled by a wobbly table or cabinet. Our cabinets feature stainless steel legs you can adjust 1” to create a stable, non-rocking cabinet position. · Stainless Steel Bar Pulls: Included with all cabinets, our stainless steel bar pulls create a tasteful, stylish, and crisp look on the outside of our drawers and doors. There are many options when it comes to cabinets and colors. Choosing the right one is a matter of identifying what you're using them for, such as garage storage, a deck kitchen, an outdoor grill, or a mudroom shoe rack. Always plan for ample storage by measuring the space before designing your layout. Once you've got your measurements, it's time to look over the options for cabinets. Select White, Black, or Ash to complement your space. · 83" Bench Storage: This is the ultimate sitting bench and storage unit, with a hinged top that opens upward that provides an incredible amount of space. · Mobile Cart: This cart attaches to the bottom of your Wolf Endurance cabinets and includes two swivel and two locking wheels. Available in lengths of 48", 72" and 96", this cart makes it easy to move your cabinets or grill without lifting. One of our main promises is to do everything in our power to reduce the amount of time and energy our customers need to select and install cabinets. If creating your own cabinet design from scratch sounds like work, check out some of the designs we've come up with. · Weekender: This classy grill setup looks at home on any deck or patio. Featuring counter space to the side of a full propane grill, this combination is 60 inches wide by 28 inches deep. It includes one 18-inch propane base and one gas base grill, as well as two finished side panels. · Staycation: This adds one more 24-inch base with one drawer to the Weekender, which includes a wastebasket pull-out. The effect is more counter space and storage, meaning easier cookouts and more hands helping you. It's 84 inches wide by 28 inches deep. · Oasis: The Oasis adds even more counter space with an additional 24-inch base, allowing you to store anything from an extra propane tank to stacks of serving platters. It is 108 inches wide by 28 inches deep. 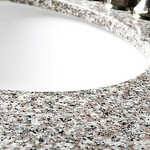 · Entertainer: This piece adds a corner and more countertop space to the previous model. With a total of seven drawers, one wastebasket cabinet, and five storage doors, you won't run out of room with this one — it's perfect for entertaining larger groups. In assembled form, it is 115 inches wide by 90 inches deep. · Regal: The closest thing you can find to a kitchen outdoors, the regal adds a 36-inch sink base to the mix. This means you can grill your food, dispose of your trash, grab all your dishes and utensils and wash them all without ever having to set foot inside. In short, it is the perfect environment for outdoor fun. Its dimensions are 108 inches wide by 109 inches deep. Please note that grills and countertops do not come with our combinations. Back and side panels can be purchased separately to create a finished appearance for your outdoor kitchen. · Aluminum Construction: Aluminum is perhaps the most coveted metal for building outdoor furniture. Its resistance to corrosion and its strength make it ideal for the long haul, meaning you’ll get many years of use out of your cabinets. · Powder-Coated Finish: Oftentimes the first impression of cabinets is that they are only as good as their surface treatments. Powder coating is undoubtedly the most durable and effective option available today. Powder-coating the aluminum provides for a finish that protects the cabinet from just about anything you — or nature — can throw at it. 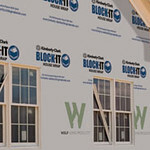 · Sealed Storage: Moisture is the greatest enemy of the builder. It rots, molds, and corrodes most anything we use to build our homes. That's why Wolf Endurance has a host of unique engineering capabilities designed to keep moisture out. You'll always find your items dry, clean, and pristine — even after the mightiest rain storm. · Fully Assembled: Wolf Endurance cabinets, however, come fully assembled and ready to use. Come rain or shine, they will work beautifully without the hassle of assembly. · Lightweight: One of the best qualities of aluminum is the ability to pick it up and move it. Particularly with cabinets — which at some point you may want to move to another spot — manageable weight is a much-appreciated quality. Most importantly, however, the low weight does not come at the cost of strength. · Easy to Configure and Install: Wouldn't it be nice if every surface we dealt with were level, plumb, and square? Since this isn't the case, Wolf Endurance cabinets are made to fit nearly any space. If you're installing your cabinets on decking or other level surfaces, adjustable feet allow you to make it level. Custom configurations mean you can have your cabinets fitted for any space in your home. · Recycled Materials Mean Green Cabinets: Wolf Endurance cabinets are made from 25 percent recycled materials, which reflects our commitment to creating quality products while also being friendly to our planet. To install our cabinets, simply read over our installation guide. It includes tips for cleaning installing islands and permanent wall runs. Make sure you use safety goggles and gloves — you should also have a few essential tools to ensure you're ready for the job. With more than 175 years of business experience guiding us, Wolf Home Products remains one of the building products industry's greatest innovators. Whether you're looking for an indoor or outdoor kitchen, a new bathroom vanity, or replacing that old deck, Wolf has your covered with premium products without the premium cost. Additionally, we deliver our customers' orders in a fraction of the time of our competitors. This means you'll have high-quality cabinets you can quickly install and start enjoying. With our industry-leading warranties, you know we'll stand behind our products. Find a dealer to learn more about adding Wolf Endurance Cabinetry to your outdoor space today!